Completely updated for the 2018 model year, the Buick Regal Sportback sees only refinement upgrades for 2019. If you are new to Buick's Regal, it's technically a hatchback. Thanks to some clever design engineering, however, the Regal doesn't have the tall, boxy rear end common on many hatchbacks. Instead, Buick designers have gone for a more refined fastback sedan style. But once you open up the "trunk," you'll see that the hinge is above the rear window and hatch struts push the door upward to create a large opening. It's a unique offering that covers the bases of two different car buyers: traditionalist design seekers (like us) and utilitarian users. Kudos to Buick's design team. The 2019 Buick Regal Sportback has five trim levels. Though the performance-tuned Regal GS is sometimes marketed as a separate vehicle, we discuss it in this trim comparison because it shares such similar dimensions with the Regal Sportback. There's also a station wagon/crossover variant known as the Regal TourX available. Even at its cheapest offering, the Buick Regal has some affordable luxury offerings for many buyers. The entry-level trim of the 2019 Buick Regal Sportback is simply called "Regal." Its standard offerings include a 205-hp, 260 lb-ft of torque 2.0L turbo engine. The interior of the car features branded QuietTuning technology, a rear vision camera, and a 7-in diagonal infotainment touchscreen display. Another nifty feature is called Teen Driver Technology. This customizable driving mode is programmed to be associated with a specific key fob. When activated, it has speed and volume alerts, as well as sends "report card" updates about vehicle activity. The Preferred trim bumps up the starting price just a little bit more to $28,595. With that higher price point come a leather-wrapped steering wheel, auto-dimming rearview mirror, and eight-way power driver seat with two-way lumbar support. Other than those three features, however, we don't see many other noteworthy standard additions that make the Preferred trim stand out. Instead, it seems to simply serve as the trim at which various add-ons become available. Otherwise, we suggest opting for a higher trim for a more complete package of features. With a starting MSRP of $30,695, the Preferred II trim ups the ante a little bit more. The interior styling includes sport seats with leatherette bolsters and cloth inserts. Rear seats are now a 40/20/40 split-fold design instead of the previous 60/40 configuration of previous trims. Front seat passengers will appreciate dual-zone automatic climate controls and a heated, leather-wrapped steering wheel. The Buick infotainment system now features an 8-in color touchscreen. 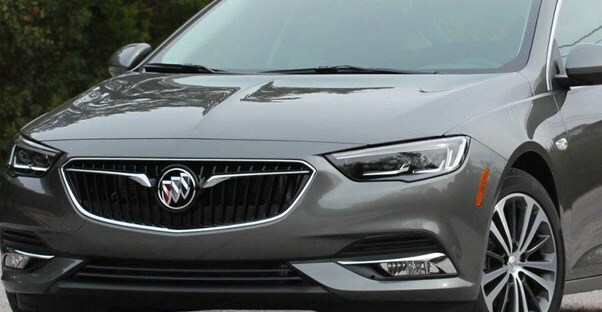 On the exterior, the 2019 Buick Regal Sportback Preferred II features fog lamps and 18" machined-faced aluminum wheels with painted sockets. An all-wheel-drive powertrain is available beginning with this trim. The Essence trim focuses specifically on driver comfort. At a $32,695 price point, buyers will find leather-appointed front and rear seats. There are no cloth inserts here. Additionally, the Regal now has heated driver and front-passenger seats, as well as 8-way power passenger seat with 2-way power lumbar support. This feature was only available for the driver on the previous two trims. If you are thinking about the Preferred II trim for your 2019 Buick Regal Sportback, we suggest you opt for the Essence instead. It's only $4,000 more than the Preferred trim and seems like a more well-rounded step up than the half-step of the Preferred II. The Avenir trim is peak luxury for Buick. Think of it as akin to GMC's Denali branding. Avenir-level models are the best Buick has to offer consumers. Exterior features include 3D grille in black ice finish, 19" aluminum wheels, and LED cornering headlamps that are auto-leveling. Inside, you'll find quilt-stitched leather-appointed seats. Technically the 2019 Buick Regal GS is marketed as a separate vehicle, not an additional trim. For our purposes, however, we will discuss it here since it features the same "Sportback" design and dimensions of its less performance-focused siblings. Whereas the trim options of the 2019 Regal Sportback all offered a 2.0L turbo 4-cylinder engine, the only engine offering on the 2019 Regal GS is a 3.6L V6. That makes sense for this racing-inspired model since the V6 is capable of 310-hp and 282 lb-ft of torque. There is also a 9-speed automatic transmission that you won't find on other Regal models. The powertrain is all-wheel-drive, of course. Brembo front brakes, rear decklid spoiler, air dams, ground effects, pass-through exhaust, and 19" cast aluminum wheels complete the exterior look. The interior carries over the racing theme with high-performance heated, ventilated bucket seats with massage and integrated head restraints. Just because the Regal GS is performance-focused doesn't mean it lacks on the safety front. Included standard are lane change alerts with side blind zone alerts, as well as front and rear park assist. The starting MSRP is $39,995.